We start with Rubufaso Mukufo, who offer up 11 songs in a face-ripping 10 minutes. As you can probably imagine, this is fast, furious, and takes no prisoners. The band incorporate some death metal influence into their gut-scraping delivery, although the songs are far too short and ferocious to truly develop this side of their sound, other than a few melodies and solos, and bits of the riffs here and there. The vocals are nicely varied, but completely caustic whatever style they’re in. Brutal grunts are common, but other modes of assault are used throughout the tracks. A strong production complements the band’s muscularity, and the murderous grind they peddle is very well-received. I was unfamiliar with Rubufaso Mukufo prior to this split, but it’s safe to say I’m a convert now. They finish with a Malignant Tumour cover, and their work is done. After 11 tracks of violence, we’re only a third of the way through this split, with two more bands to come. Nervous Impulse are next, and their 10 minute slot is filled with five songs. Ever since their exemplary 2015 release Time to Panic, which made it on to the year end best of list for that year, I’ve been looking forward to hearing this band once more. The songs on this split are savage and ugly, filled with multiple reference points from a whole host of different extreme metal sub-styles, all coalesced around a core of naked hatred and furious aggression, the likes of which many bands struggle to achieve. Despite the relatively brief nature of the songs there’s a good amount of variety on offer here, within the obvious style constraints, of course. Outright brutality, snippets of extreme technicality, scathing chaos, atypical groove, fractured melody, and mutant screams are all accounted for at various points in these songs. Filled to the brim with nasty extremity and precise butchery, I’m very happy to report that after enjoying Time to Panic so much, this latest batch of songs doesn’t disappoint at all. The final band on this split is Epicrise. They give us seven songs in eight minutes, three of which are cover versions, (Dead Infection, Grossmember, and Cerebral Turbulency). Epicrise’s brand of mayhem is punk-infused and powered by brutal shouting growls. The tracks are short and to the point, full of an infectious energy and sickened delivery. The band’s blasting speed and dirty grooves make for some enjoyable tunes. It’s a great way to bring this split to a close, and all three bands have made a huge destructive mess of things that they can be proud of. 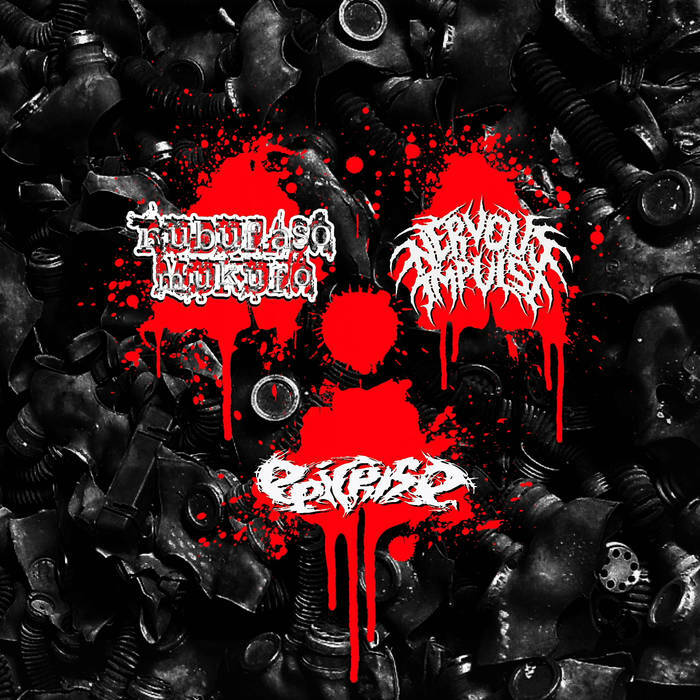 This entry was posted in Grind and tagged Cerebral Turbulency, Dead Infection, Death Metal, Epicrise, grind, Grindcore, Grossmember, Malignant Tumour, Metal, Nervous Impulse, Rubufaso Mukufo. Bookmark the permalink.